Z is 2 years old and 8 months old now mashaAllah. He is a completely different character to R. SubhanAllah! It’s strange because when R was his age we started formal home ed and I can’t imagine ever starting that early again with Z.
Whilst R is doing her work, I occupy Z with his toys, puzzles, arts and crafts, videos and I read to him. I do try and give him a little of his own time each day as I feel that between the demands of his older sister and younger brother, it would be easy to just ‘ignore’ him and get on with it. But he is my child too and so deserves his time doing things with Ummi. Z is a typical boy who loves cars, is obsessed with trains and fire engines and can’t keep still for more than a minute! He keeps me on my feet and I think were it not for his energy, I would surely be more overweight than what I am! He is speaking more and more now mashaAllah and I find that whilst he was a real handful a few months ago, he is calming down a little. Z loves everything messy and so when the arts and crafts comes out – he goes mad! Gave Z a large sheet of sugar paper and chalk. He drew all over the sugar paper. I then folded another piece of sugar paper in the same colour into two and drew two ears which I cut out for him. 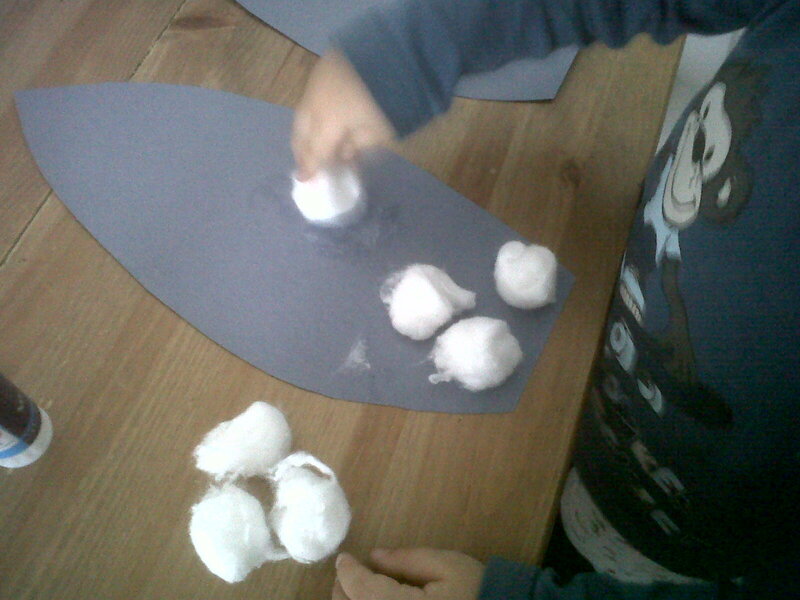 Laid them out and he decorated them by sticking cotton wool balls with pritt stick. 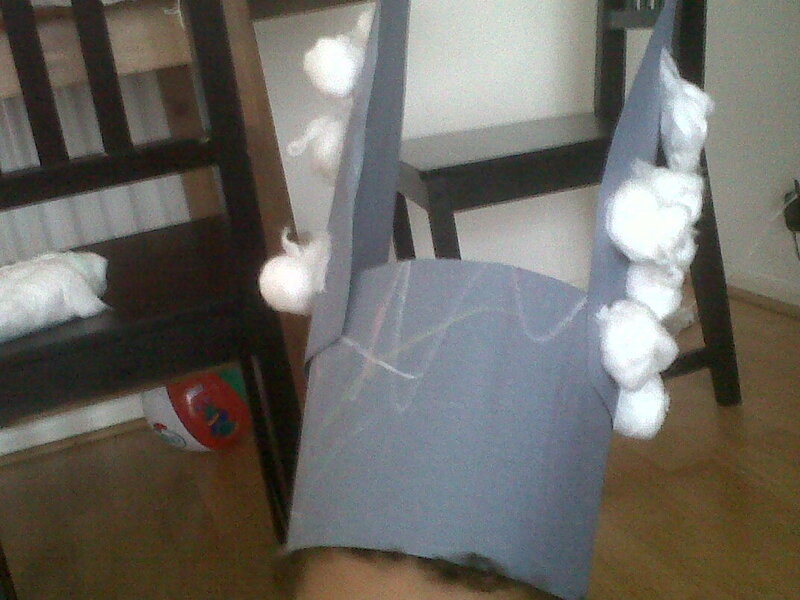 After that, I cut the paper that he drew on into a large strip and fit it around his head and stapled it together. Stapled the two ears on to each side. And that was it! Bunny ears. I can’t tell you how much he loved this. He wore it all day – through each meal and wanted to go to bed with it! Simple, easy, quick enough to hold the attention of Z and not too messy. Ikea do a really good and cheap train set. Wooden tracks and wooden magnetic trains. The track pieces can make different designs and there are some bridge pieces in there. Z loves it and it does keep him occupied alhamdulillah. 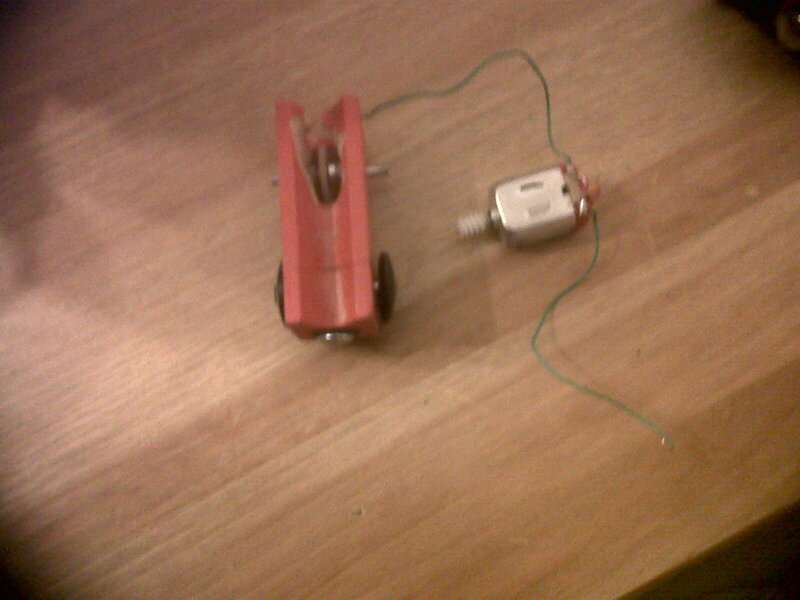 So, my husband and R set to work on making their very own battery operated train. I guess this was an activity that all of them joined in. 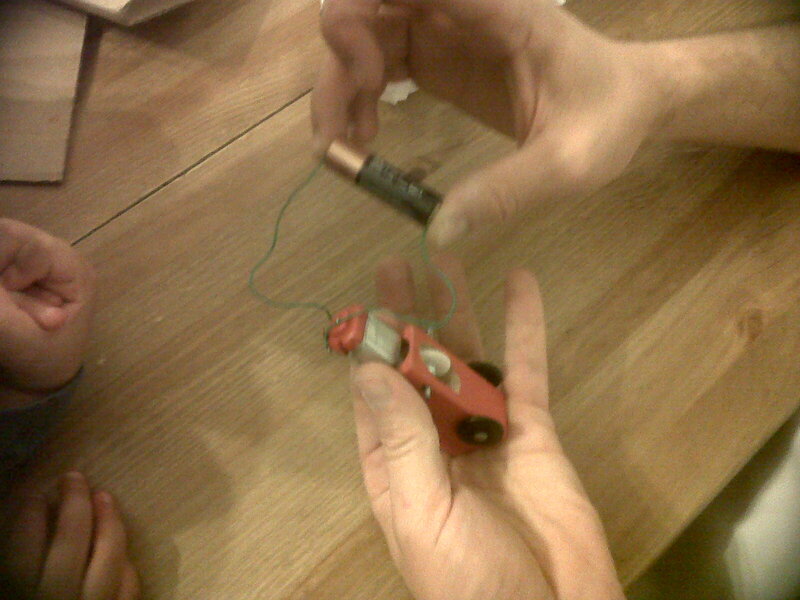 Hubby took some old wire out of something, a battery and attached it all the to the train. R tested it out. And Z just wanted it to MOVE!! I actually took a video of it to show that it did work but I can’t seem to figure out how to upload a video to wordpress. If anyone knows, please let me know and I’ll put it in. Now, we could have just bought a battery operated train, but what would have been learnt?! R learnt some electronics and I guess so did Z and it was a much more thorough learning experience. Alhamdulillah the IHSAN website and forum is going well. Alhamdulillah we have a great community developing on the forum with 45 members from different continents. Why not come and join us insha’Allah. A lot of Qu’ran. She finished memorising surah balad masha’Allah. Now on to surah Fajr. Once she finished memorising surah balad, I printed out this workbook on surah balad. A sister made it, masha’Allah may Allah (Swt) reward her. She also made another one on surah fajr. So once that has been memorised and we work on it, I will post it up here insha’Allah. We have been reading a lot! I have been reading so many books to her and it has been nice to spend quality time just reading. Something funny happened though: I was reading a book to her and noticed that something was unIslamic so I tried to ‘islamify’ it and read something about Allah. (It wasn’t an Islamic story book!) So, she stopped me, looked at the cover, returned back to the page I was reading and said: “Ummi, I can’t find where it says, “Allah didn’t like that. But then forgave him.” LOL I didn’t know what to say!!! Okay, so now that she is reading it looks like I am going to have to read word for word!!! She used her journal. For those that haven’t seen previous posts on this. She draws a picture, and tells me about the event that she is journaling and I write down IN HER WORDS wht she dictates. It allows me to see how she is progressing in her vocabulary and speaking skills. 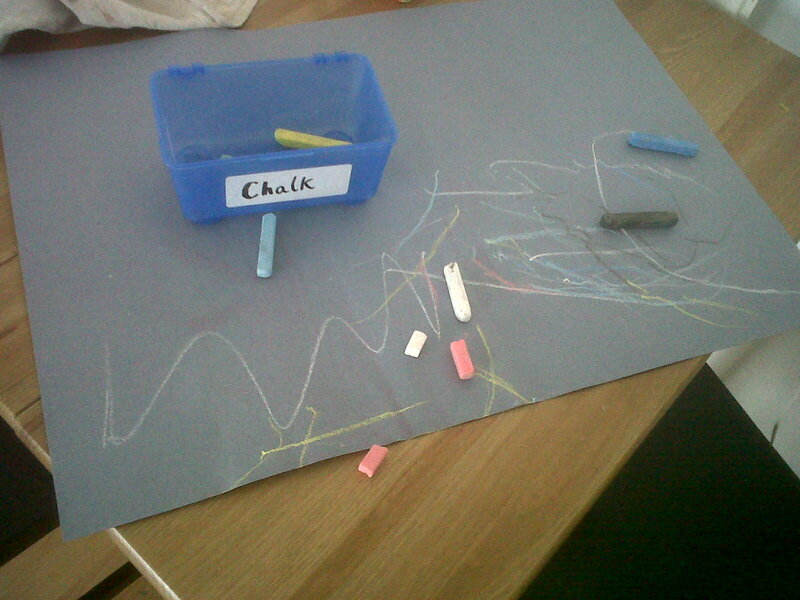 I can see that R doesn’t like drawing very much. She quickly draws something without paying much attention to it – like she wants to get it over and done with. I think she likes writing more? Should I push her to improve in her art work? Or leave it? Lots and lots of painting. She made this butterfly from hama beads. She really loves hama beads…good for fine motor skills. Like I said, we have been out a lot this week. It has been good for me and for her. I needed to be out to reflect a lot on a lot of things! Can you believe this is in South London? Doesn’t it look beautiful? Every Thursday we have been attending the Home Ed get together in East London. I love it. She loves it. And I think every sister and child who goes there loves it. I feel like we are building a small community of home educated children alhamdulillah. 2 weeks ago a very kind sister brought henna and they decorated cakes. It is fantastic as children from 13 to babies all mix together alhamdulillah. As if numbers and chocolate wasn’t enough, we did a very late science lesson at 7pm on Monday evening. My excuse is that I am almost 8 months pregnant – so bring on the lessons involving anything ‘sweet’ that is edible…of course! So, what did we do? 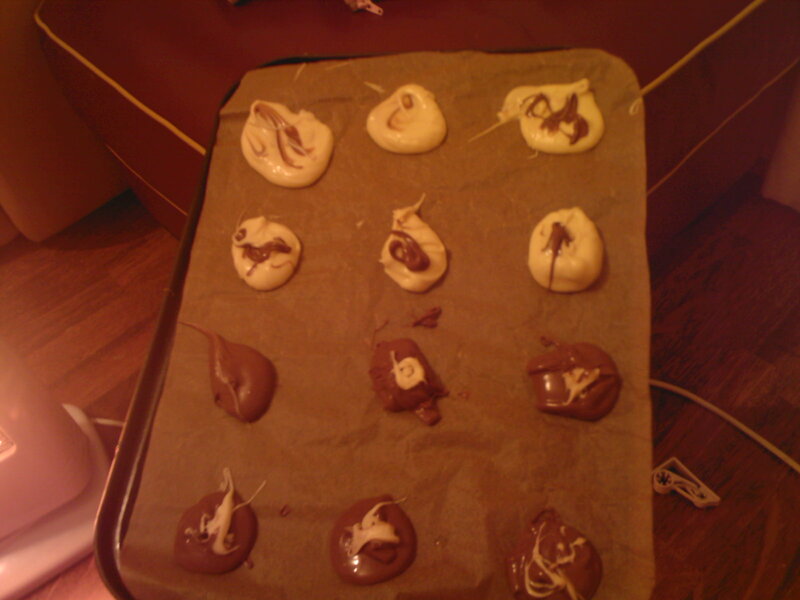 We made chocolate swirls. Yummy! 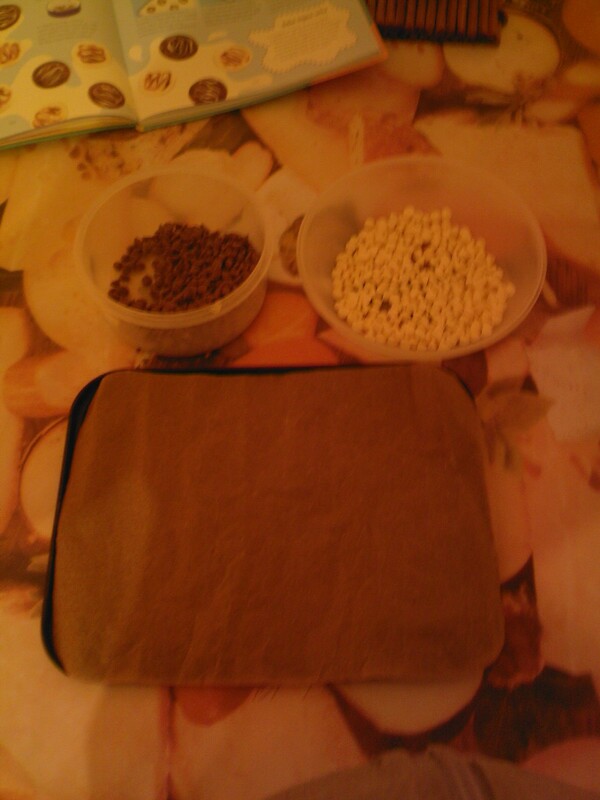 Daughter and I cut some baking sheet paper and placed it in a baking tray and then emptied two packets of white and milk chocolate chips into two separate containers. I boiled some water in a pan and explained what ‘boiling’ was. I then placed each container into the pan and daughter mixed the chocolate chips until they melted. We then had a very interesting lesson on solids and liquids and melting! Once both sets of chocolate chips had melted, we spooned 6 of each onto the baking sheet paper and then swirled the opposite colour into each one. The tray was then placed in the fridge so that they would harden. After 45 minutes, we took them out, peeled them off the baking sheet paper and my daughter was fascinated that they were hard – which of course led us onto ‘freezing, and liquids to solids’. She was so excited! When her father walked in from the masjid, she exclaimed: ‘Abi – we made chocolates that were soft, but they’re hard now!’ So, alhamdulillah she understood what I was trying to teach her.